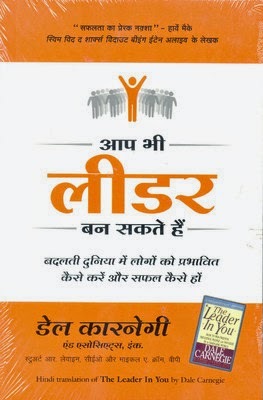 The Leader In You, translated into Hindi as Aap Bhi Leader Ban Sakte Hain, is a best-selling self-help book on leadership by Dale Carnegie. The works of Dale Carnegie and Associates have been a staunch pillar of inspiration for readers for nearly a century. In this title, Stuart R. Levine and Michael A. Crom reintroduce readers to the human relations principles laid down by Dale Carnegie and show how anyone can tap into their leadership qualities through creativity and enthusiasm. Incorporating the timeless advice of leading personalities from various feilds, this book guides readers towards honing their self-confidence, identifying their strengths and weaknesses, building a stronger team and ultimately towards controlling the situation to their advantage. Dale Breckenridge Carnegie was an American writer, self-improvement course developer and lecturer, corporate trainer and public speaker. He is best remembered for his books: How to Win Friends and Influence People, How to Stop Worrying and Start Living and Lincoln the Unknown. Struggling through poverty in his childhood, Carnegie studied at the State Teacher's College in Warrensburg. He worked in various faculties involving selling until he quit to become a lecturer, instead becoming an actor of little success. He began developing what is now called the Dale Carnegie Course by asking people at the YMCA to speak on what makes them angry. His course remains one of the foremost courses on self-improvement and is used as a corporate training program even today.